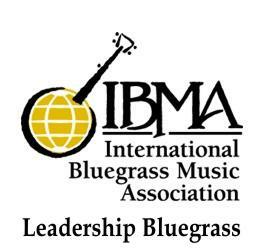 Nashville, Tenn....The International Bluegrass Music Association (IBMA) is proud to announce the graduating class of Leadership Bluegrass 2012. Leadership Bluegrass, now in its 13th year with more than 300 alumni, is an intensive, three-day program of interactive learning and networking experiences that invites participants to examine the challenges and opportunities facing our music, along with related leadership issues. The Leadership Bluegrass program pulls together a cross section of people with exhibited or potential leadership qualities into a network of learning and communication. The results will foster a broad-based understanding of the total needs of the bluegrass community, which will help participants better prepare to determine the goals of the particular organization, company or group in which they choose to serve. The International Bluegrass Music Association (IBMA) has a program for professionals within the bluegrass music industry to improve what they do. The purpose of the Leadership Bluegrass program is to pull together a cross section of people with exhibited or potential leadership qualities into a network of learning and communication. The results will foster a broad-based understanding of the total needs of the bluegrass community, which will help participants better prepare to determine the goals of the particular organization, company or group in which they choose to serve.